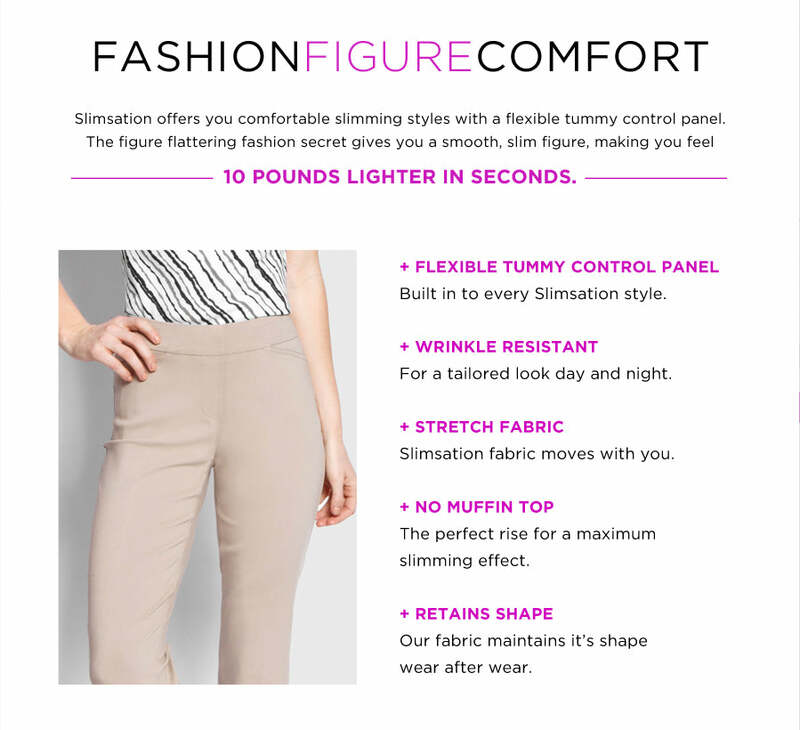 Slimsation offers you comfortable slimming styles with a flexible tummy control panel. There's no need for a constricting, uncomfortable control undergarment. Each pair of Slimsation pants has a built- in panel that works to contour your waist, slim your tummy, and shape your hips, all while keeping you comfy. You can look and feel great, wherever you're going and whatever you're doing. The tummy control panel works the same way in both casual and formal styles. After all, you want to look fantastic all day, every day, not just on special occasions. The Slimsation line features colors, cuts, and styles that will suit any woman's personal look. For a tailored look day and night. Slimsation fabric moves with you. The perfect rise for a maximum slimming effect. Our fabric maintains it’s shape wear after wear. I have bought 8 pairs of narrow and ankle pants, plus the shorts. This is all that I wear now. Thank you for having such a great product! Love, love, love my Slimsation ankle pants. Amazing feel and fit. I now own 3 pairs and plan to buy another. Lots of support just where you need it! Very true to size and they wash great and hold their shape. The only pants I wear are Slimsation. I love the fit and the fabric. Being short the ankle pant is perfect in that it doesn't need hemming. Comfortable and flattering fit...who could ask for more?! They are great, had one pair and wear them almost everyday. Will be ordering again. They even look good on a size 8, 78 Year Old Lady!!! !